Reception of some Sky and Freesat channels has been affected by apparent low power on one of the satellites used to serve UK and Ireland viewers. On Sunday evening, numerous viewers reported the loss of some services, including ESPN HD over the course of several hours. And in recent days some viewers have reported difficult reception of some free-to-air services, including CBS Reality, Bonanza Bonanza and Bloomberg, with some channels affected by pixelation. And some Freesat viewers have reported seeing the error message "default bouquet missing", which is linked to reception of the Freesat Electronic Programme Guide. All affected services are on the Eutelsat 28A satellite, which is being received with a much lower signal strength across the UK and Ireland since the weekend. The satellite, formerly known as Eurobird 1, was launched in March 2001 and is nearing the end of its life. Viewers with the smallest type of satellite dish - the Sky Zone 1 dish - are more likely to notice issues with reception. However, a replacement is imminent, which should improve reception. Following the resolution of a long running dispute between Eutelsat and rival operator SES, which operates the Astra satellite fleet, it was agreed in 2013 that SES would take services from Eutelsat 28A. SES is currently moving new satellite Astra 2G into position, which will enable Eutelsat 28A to be removed from service. Its arrival into service was delayed when its launch into space had to be postponed due to issues at the launch site last year. 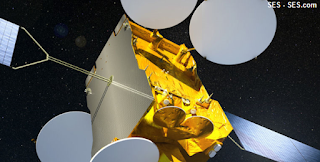 As a result, TV, radio and data feeds currently on Eutelsat 28A are expected to move off the satellite starting early June.